Top photo: Richie Wilhelm digging deep at Red Bull Archer’s Paradox, held in Hastings, Minn. Bow in hand and arrows on my back, I lurched down a rocky, loose switchback toward a target. My legs felt emptied, my heart rate jacked as I fumbled to nock an arrow. One big, slow breath to settle my body, draw, and take aim. I let my arrow fly and watched it slam into the target 41 yards away. I was halfway through the course. This is Archer’s Paradox. 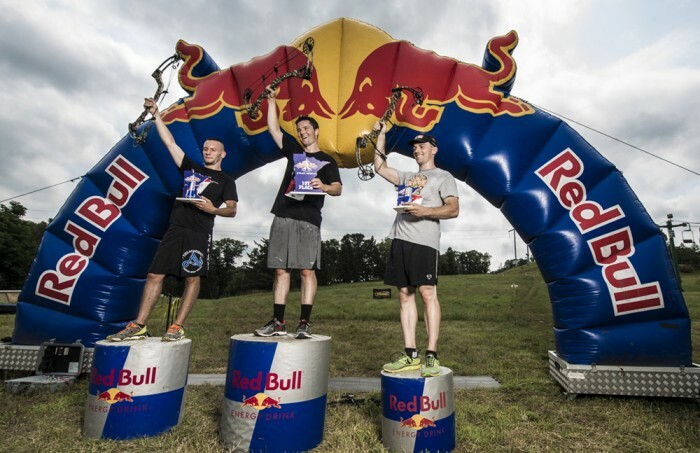 Red Bull and Matthew’s Bows co-hosted a first-of-its-kind event at Afton Alps Ski Resort in the river bluff region of east-central Minnesota this past weekend. 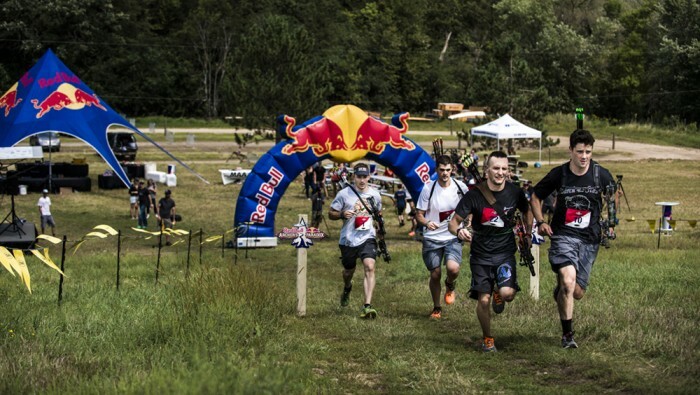 The Red Bull Archer’s Paradox attracted a field of 34 bow-and-arrow-wielding men and women to compete in the biathlon-like run and shoot event. 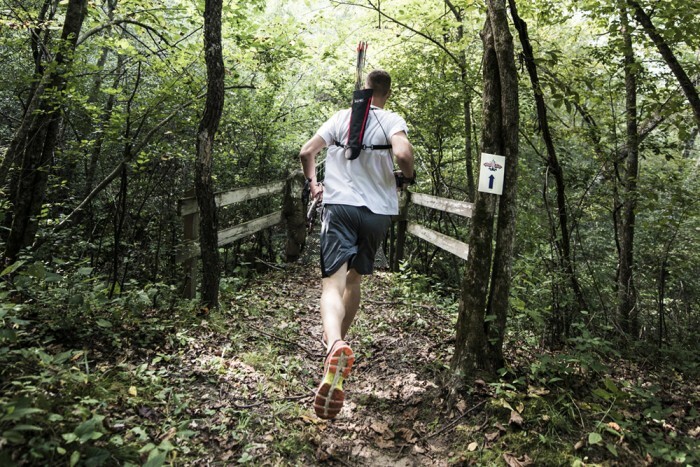 The one-mile course sounds easy on paper, but from the gun, it was an unrelenting suffer-fest. Straight up the ski slope to target No. 1, your heart rate was pegged. The course led us along loose, sandy roads; rocky, rutted, and slippery singletrack; and up winding switchbacks. All the while we fought to balance strong effort with a calm enough heart rate to shoot straight. Advancing to the next round meant doing it all over again. The final group of four racked up 4-plus miles in the end. The event favored a strong athlete over a skilled target shooter. Targets ranged from 15 to 40 yards, but most were chip shots for any decent archer. Some of the unconventional targets presented a mental challenge. We saw one large target that had a small window to thread the shot through. Another spinning target demanded good timing of the release. To my relief, the shooting was easier than expected. Two missed shots would result in a 30-second time penalty. To be in the running at all, you really could not miss a target. Archers of every size and shape showed up to try and grab the cash and gear prizes. Three tough ladies showed up to duke it out with the dudes — one making it well into the elimination rounds, sending many men away humbled. Katniss would be proud. One (awesome) gentleman brought his longbow, otherwise it was a compound bow party. 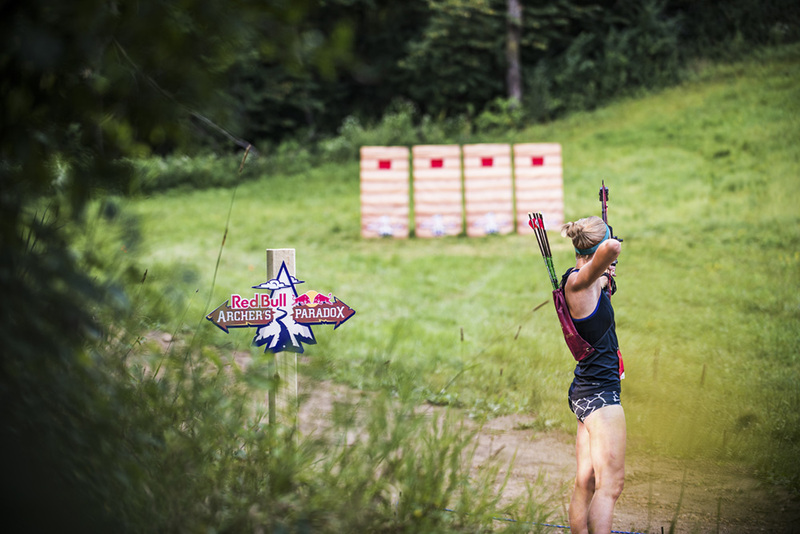 Those of us that advanced into the final rounds were a solid group of fit, fast, and straight-shooting athletes. Naming this event Archer’s Paradox was genius. Running and shooting a bow is an art mostly lost, and for good reason! 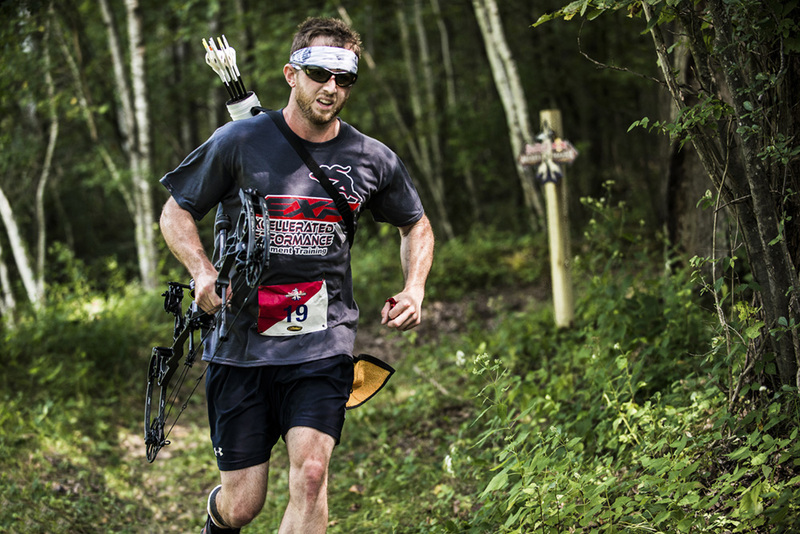 Running with archery gear in hand is awkward and difficult. Tricky footing on burning legs threatened to upend us constantly. Several racers ate it out on the course. Shooting well with a raging heart rate requires patience and determination. Advancing to each next round was a bittersweet victory. Repeated all-out efforts left us sore and tired, our weaknesses exposed and bare for all to see. My day ended after Round 3 (of 4), where some small fumbles with my bow created a gap I could not close. I bared my teeth and punished my legs to catch up, but it was not enough. The final group of four runners took off to a roar of cheers and whoops. 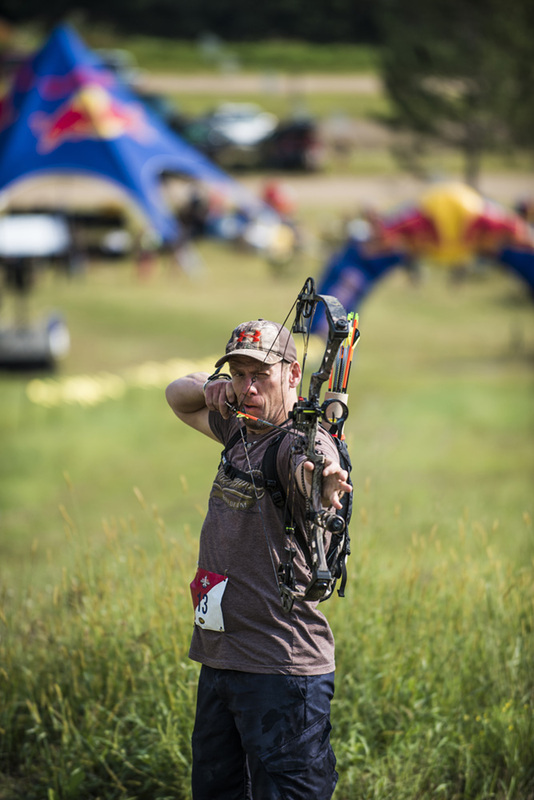 At the finish, Devin O’Brien of Minneapolis handily won the top spot and took home $1,000 and a new Matthews No-Cam bow. His finishing course time was a blistering 8:35. William Gear and Jake Gleitz rounded out the podium. Win or lose, I think we all had a ton of fun. Based on the vibe I got from all my fellow competitors, this event was a hit and has potential for serious growth. Organizers were open to constructive feedback on how the event could be improved. Either way, events like these are a big win for the active and archer communities alike. We’ll be back at the start line next time around.